This is the ultimate after school treat to keep little bellies happy until dinner time. This thickshake revives childhood memories of the afternoon fruit milk shakes my brother and I enjoyed as children. My brother was a fussy eater and in hindsight I think that this was how my mum managed to get his fruit quota in each day! I love sharing (and reliving) my food memories with my own children. The ingredients are simple and will please even the fussy eaters of the family. 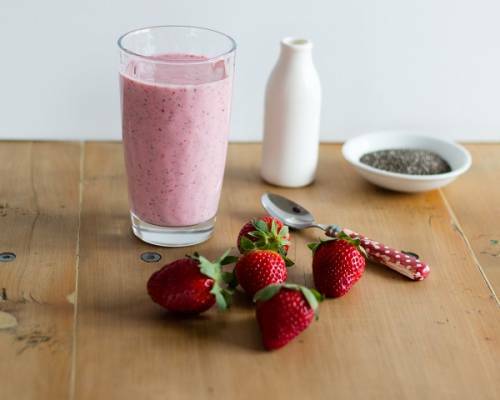 The chia seeds add to the thick texture of this shake and also give it a nutrient boost. Spring brings a new wave of fruit, notably the strawberries begin to appear in some areas of Australia. They are more abundant in Summer but an early appearance is a welcome start to the season. Snack boxes and desserts are refreshed with the new wave of fruit after Winter. Add the ingredients to the small Blitz2Go container and pulse until the berries are processed well.